Having an organized + profitable business is totally possible! Setting big-picture goals for my business is something I’ve never been good at. I’ve always thought of a new idea and ran with it, not thinking much about what it actually meant for my business. 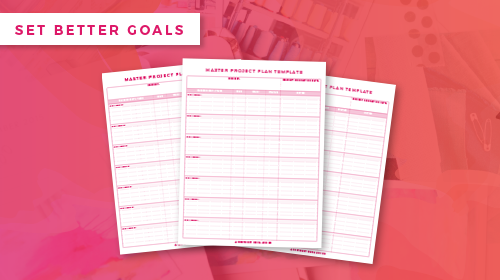 The templates inside of Goal Setting Kickstarter make having an organized and profitable business possible for me. Heck, even creating financial projections for the upcoming year was fun! I can’t wait to see how these templates improve my business in 2018! A must-have for your tool box! I always avoided plotting out my yearly budget because I thought it might stifle my creativity and flexibility. But it turns out I just didn't fully understand why doing a budget projection mattered. Now that I have used Reina's method and template to build a budget for next year, I have a new sense of clarity and freedom. Even better, I finally have a plan! It’s time to Set Better Goals. You’re a list-maker and you’ve got one for dayssss. You sat down to write your big goals for the year. But every year those goals get put on the back burner and you’re frustrated that you didn’t accomplish them. You have lots of ideas but you’re not sure where exactly you need to focus your attention. You know you should have content planned but most of the time you’re just flying by the seat of your (yoga) pants. You'll be clear headed because you have a plan. Have a path to follow each time you sit down to work because you know what the next thing you need to focus on is by the time you get there. All those BIG dreams are possible if you have the right tools to get you organized to Set AND Stay on top of your goals! I've put together ALL the templates I use in my business into one place.